“You broke me unfixable,” states the titular Judas Iscariot in The Last Days of Judas Iscariot, Scotch’n’Soda’s latest production. This play is an irreverent play about religion, guilt, and forgiveness, written by Stephen Adly Guirgis and directed by junior history and English double major Razghiem Golden with assistance from junior Bachelor of Humanities and Arts student in architecture and ethics, history, and public policy Anna Failla. The play starts as a stereotypical courtroom drama in purgatory at the appeal trial of Judas Iscariot, played by senior psychology major Wyatt D’Emilia. Plucky lawyer Fabiana Aziza Cunningham (junior dramaturgy major Jacqueline Mishol), rises to the challenge to defend the traitor apostle. However, she and the entire courtroom get more than they bargained for as the play develops into a genre of its own. The Last Days of Judas Iscariot, which is set in purgatory, depicts an interesting version of the afterlife. According to the play, purgatory changes its appearance according to the times. In this case, the afterlife is Americanized. There are biblical characters speaking with New York accents and historical figures who dress like Al Pacino. A few of the play’s many memorable characters include Fabiana, purgatory’s Perry Mason whose dark past is gradually revealed. The Judge, as played by senior Bachelor of Humanities and Arts student in music and creative writing James Alexander, is a former Civil War soldier with a southern drawl and a cynical, inflexible worldview. Sophomore materials science and engineering major Yeshar Hadi puts on plenty of hammy and smarmy as he portrays prosecutor Yusef El-Fayoumy. Satan, as played by senior Bachelor of Computer Science and Arts student Andrew Bueno, is a wildcard character who can be as suave as he can be sadistic. And, of course, there is the infamous Judas Iscariot. Along with the colorful cast, there is plenty of colorful language. In fact, there is very colorful language, as well as a few offensive jokes; this is not a play to show in Sunday school. 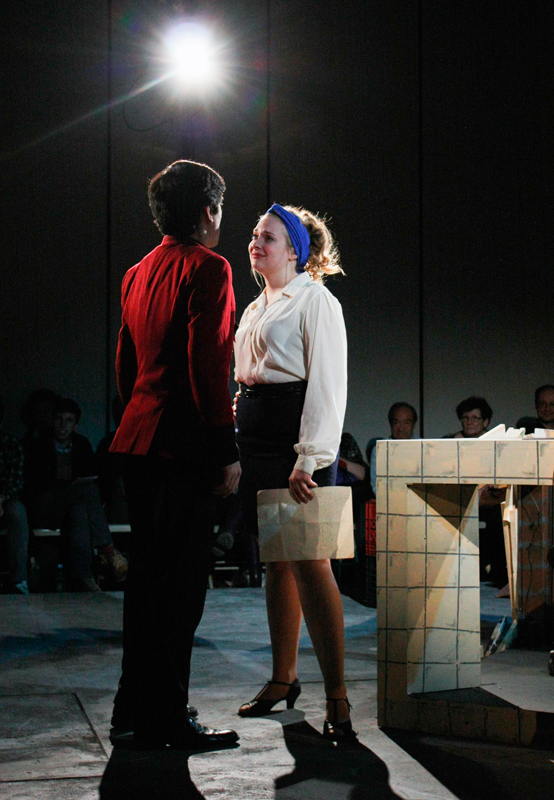 The Last Days of Judas Iscariot is also interspersed with monologues taken from various Biblical characters, including Mary Magdalene (first-year architecture major Victoria Yong), Saint Monica (first-year undeclared Dietrich College of Humanities & Social Sciences student Maggie Davis), and Saint Thomas (first-year chemistry major Ryan LaPré). For the most part, these monologues serve to segue between portions of the play and re-emphasize its themes. However, these sequences can seem out of place at times, especially since most of these characters do not appear in any other instances. The play becomes more interesting as it progresses. The beginning doesn’t seem to take itself very seriously; it acts as a parody of the legal system and the Bible as caricatures of historical figures come and go. However, the play hits its stride in the latter parts. Characters’ motivations are more developed, more serious philosophical ideas are discussed, and some of the more unique concepts come into the foreground. For the majority of the play, Judas sits alone in his personal, chilly hell at one end of the stage, and only comes out of it in flashbacks — once when he is a child and once when he is drunk. The only information the audience gains about him is what has been said by other characters. But at the very end there is a glimpse of the real Judas and why he is truly stuck in hell, as Jesus tries to comfort him. One of the most interesting features of the play is the dual casting of the same character as Satan and Jesus. It adds much more weight and thought to the final scenes. There were also many other features unique to this production. The set design was innovative; the stage was open from all sides, and actors could enter or exit from almost anywhere. The set itself was a courtroom in purgatory, and featured an interesting clash between symbols of heaven and hell. Unfortunately the seating and venue did not accommodate the set well. The venue, Rangos 3, was completely filled by the stage and seats, and if you were unlucky enough to get a seat in the second or third rows, many times you saw more of the person sitting in front of you than the set or the actors. A larger room could have gone a long way in resolving these issues. When the production was finished, there was also a special talkback session, in which the production staff, actors, and faculty who did work relating to the subject matter of the play held a panel discussion on some of the themes, history, and ideas behind it. Although Nietzsche famously declared “God is dead” more than 100 years ago, plays such as The Last Days of Judas Iscariot show that God, religion, and Christianity are still subjects of lively discussion in society. What this play brings to the table is an attempt to reconcile the many interpretations of religious scripture and come up with one solid answer to how people can best improve themselves. The Scotch’n’Soda production does an excellent job of picking at all the ideas behind the play while providing sharp comedy and intense drama.